I love giving gifts – there’s something about giving someone something picked out especially for them that just warms my heart. So cheesy, but true, and plus, I love cheese. 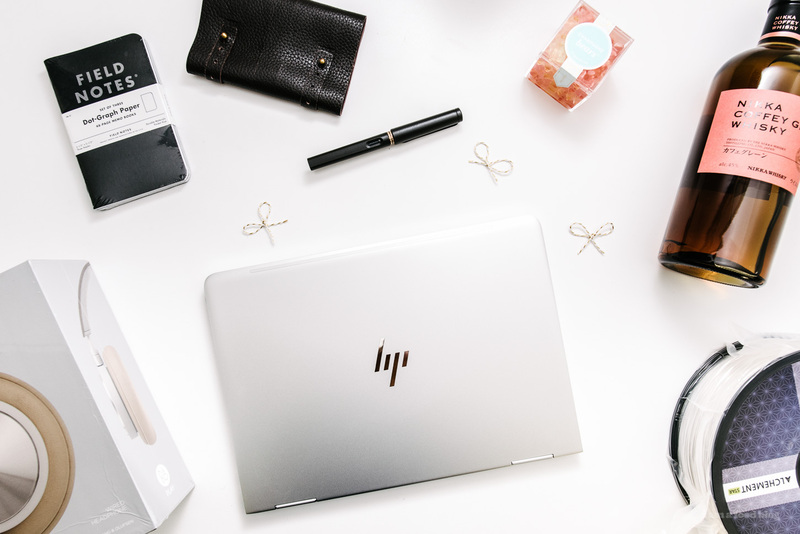 This year HP approached me to #reinventgiving by giving someone the new Spectre x360. Mike and I had an in-depth discussion on who we thought we should gift it to. We wanted someone who would really make use of it, both creatively and professionally. I didn’t really want to gift someone a powerful laptop and just have them watch YouTube on it, so we narrowed it down to a few choices. In the end we chose Logan, who is an all around good guy, loyal friend, and fun person to eat sushi with. Do you guys ever have memories that make you crack up, even though they happened years ago? I have a hilarious one of Mike, and our good friend Logan. We were having sushi – we had ordered a huge amount – and one of the pieces we were all looking forward to was the ikura with quail egg. They came on a huge platter, along with our other various sushis. The three of us did a sushi cheers (I have a tendency to cheers everything, not just drinks) and downed the pieces, which were delicious. Afterwards, when we were just chilling and chatting about what our favorite pieces were, Logan and I agreed that the ikura was one of the best. Mike did a double take and said, “what?! I never ate that one!” He was so adamant that he didn’t have it even though Logan and I were absolutely positive that he did. For some reason this was just infinitely more hilarious that it would have been otherwise. It’s one of my favorite memories of Mike, Logan, and I. My belly was full of good sushi, it was a warm California night, and we spent 30 minutes cracking up, on and off, about Mike and the sushi. It’s one of those random memories that makes me nostalgic about the good old days. The truth is, I get fuzzy and nostalgic all the time, but especially around the winter holiday season, because gifting! 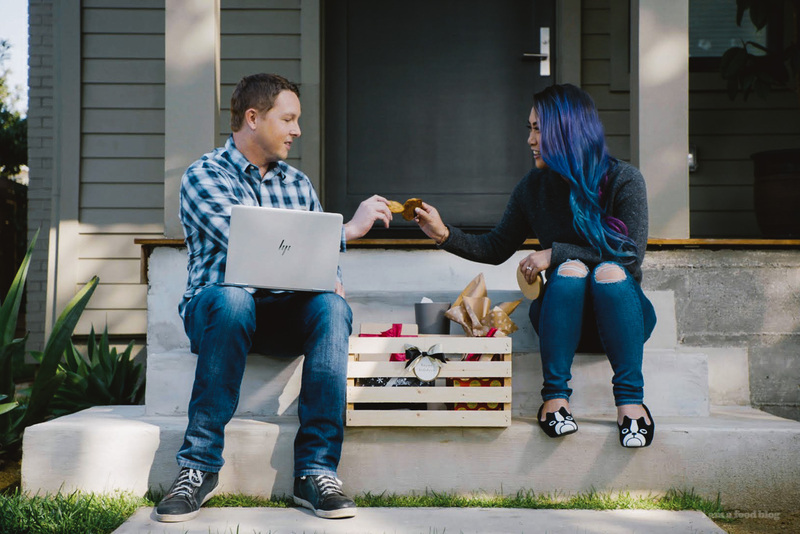 The latest HP video is all about giving a gift that can change someone’s life. Don’t the best gifts do it, in the most unexpected way? I put together a crate full of things I thought Logan would like, including the Spectre x360. There was a fountain pen, some notebooks, noise-cancelling headphones, a cable organizer, and a bottle of whiskey. But most importantly, there was a coil of food safe 3d print filament because Logan’s thinking of getting into doing a 3d printing business. He’s currently in sales, but has always dreamed of branching out on his own to start his own business. I thought a powerful laptop to go with his 3d printer would be just the thing to reinvent his career. Logan’s really into mountain biking and has been sketching up prototypes for cool things to make the mountain biking experience more enjoyable. I’m probably not the target market for his business, instead I’m uber excited (and got him the food safe stuff) because: hello custom cookie cutters! Logan’s promised me that it’s going to be one of the first things he makes, once he’s all set up with his Spectre x360. 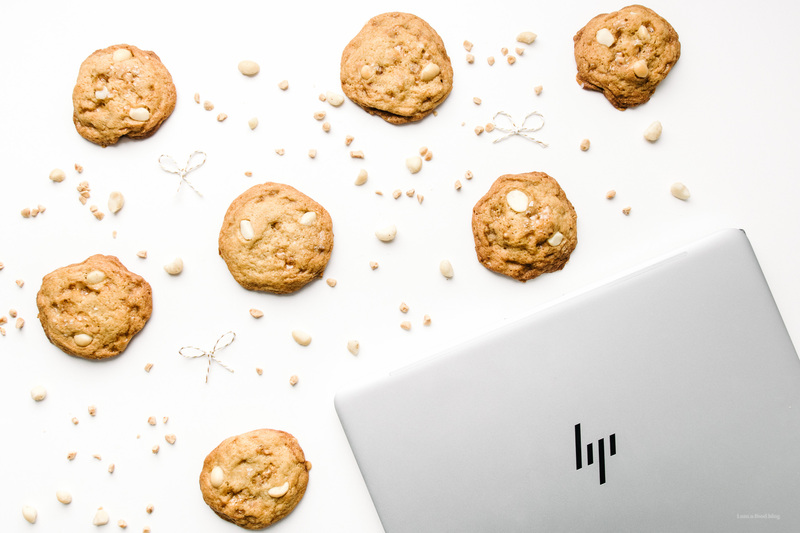 And speaking of making things while using the HP, I actually used the x360 while I made these toffee macadamia nut cookies. The Spectre x360 has a very cool tent mode that’s super convenient in the kitchen. 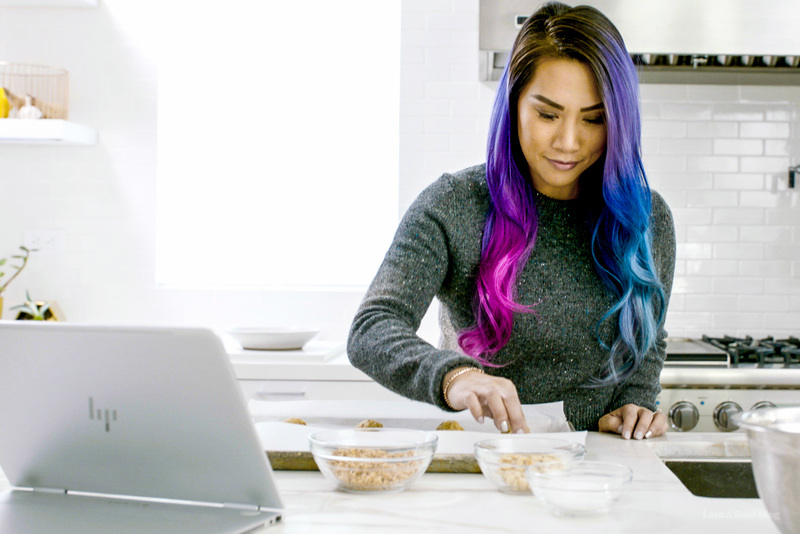 Instead of messing up the keyboard, you can use the (very wipeable) touch screen to swipe through recipes and take notes. I’m in love with these cookies. They’re a simple drop situation, full of caramel-y chew, toffee bits, and buttery nutty macadamias. The dough ages really well in the fridge and I feel like they’re just perfect for the holiday season because you can whip up a big batch, portion them out, keep them in the fridge, and bake them off as needed. Pretty sweet! And, even sweeter, you can win a Spectre x360! Just comment #ReinventGivingSweepstakes on this Insta or Twitter post and you’ll be entered to win. Good luck! NO PURCHASE NECESSARY. Open to legal residents of the 50 U.S. (D.C.) 18+. Ends 12/14/16. For Official Rules, including odds and prizes, visit http://bit.ly/2gBz4HD. Void where prohibited. Kay, chat soon, I’m off to make some lists of gifts. Hope your December is going well! 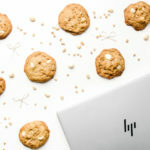 HP Presents Reinvent Giving with I Am A Food Blog from Collectively on Vimeo. These taste even better if you age them overnight in the fridge — just scoop them out, put them in a sealed container. You can bake them right from the fridge and they’ll be even more caramel-y, toffee-y, and delicious! In a bowl, sift together the flour and baking soda. Set aside. Cream together the butter and sugars until light and fluffy. Mix in the egg well. Stir in the vanilla. Stir in the flour mix until there are no more streaks, being careful not to over mix. Stir in the toffee and macadamia nuts. 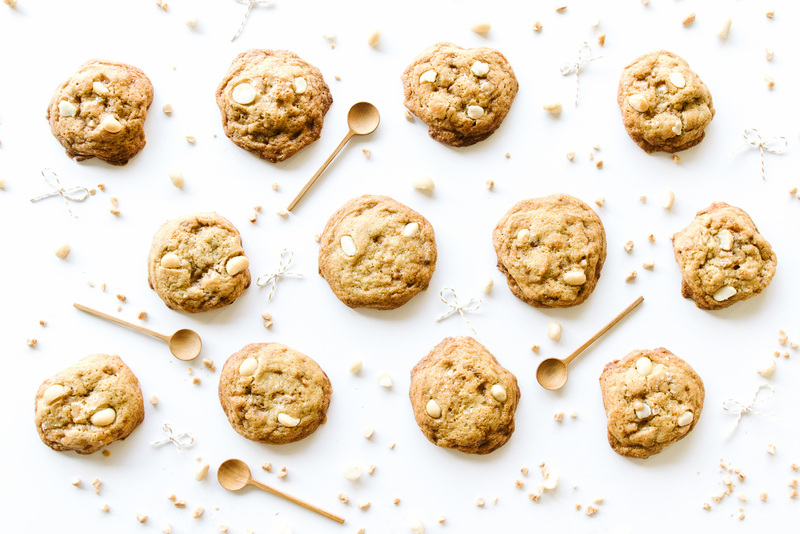 Use a cookie scoop to scoop out the cookies and place on a parchment paper lined cookie sheet. Sprinkle each cookie generously with the flaky salt and bake for 12-15 minutes, until the edges are golden but the centers are still soft looking. Let cool on the baking sheet for 5 minutes and enjoy warm! This post was sponsored by HP Spectre x360. Thanks for supporting I am a Food Blog! Mmm, they look delicious! I love macadamia nuts and you can’t go wrong with toffee. Logan sounds like a great guy! Such an amazing gift box! I love that idea, and I love how you packaged them all together. I can just imagine how excited Logan must have been to open it up. Also, that tent mode is perfect!!! 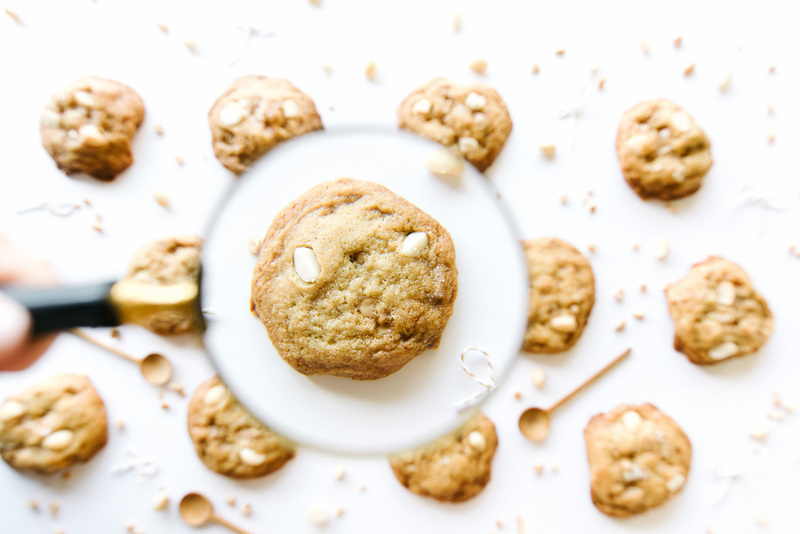 These cookies look and sound delicious, you really can’t beat a new cookie recipe! These cookies look SO GOOD! I love having cookies ready to bake in my fridge or freezer. Gotta add these to my rotation haha. 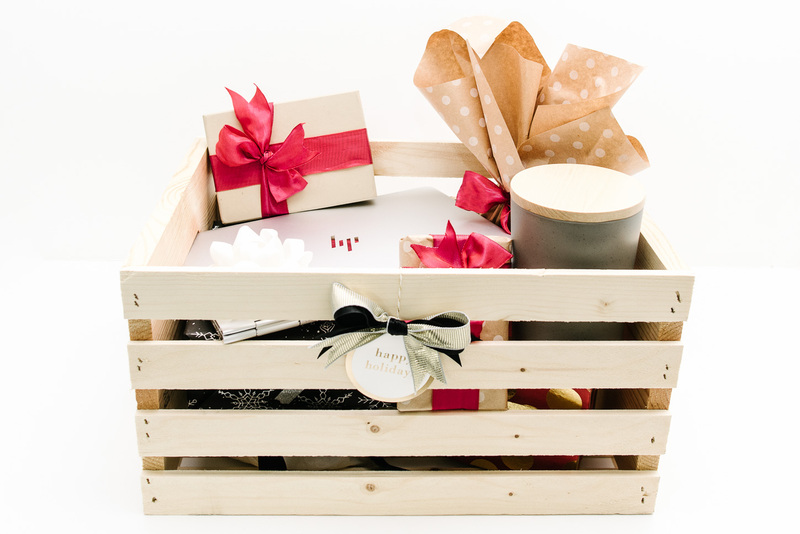 This is such a sweet gift basket! Logan is a lucky dude – he seems pretty cool, I’d eat sushi with him if it incited so many laughs! heeheee i’ll eat sushi with you sarah! It’s really crazy how relevant your blog is … all the time. 1. I was just thinking to myself how I wanted to learn how to make butter toffee cookies because there are these peppermint dusted ones at our local coffee shop that I’ve been getting daily, and then here is your blog. 2. My best friend just gifted me a bottle of Nikka Coffey Grain Whisky and I had never heard of it before – then saw it in this post! 3. And I think it was a different post but you mentioned being on a bread baking kick, and so is my fiance so our house has been full of bread lately and it’s been dangerous. Keep it up, I use your blog as my primary source of trusted recipes! !